The second season of Raw/Cooked presents a series of four exhibitions by under-the-radar Brooklyn artists who have been invited by the Brooklyn Museum with support from Bloomberg to show their first major museum exhibitions. The artists are given the opportunity to work with the Museum’s collection and to display in spaces of their choosing, however unconventional. The four artists in the series were recommended by an advisory board of well-known Brooklyn artists, including Michael Joo, Paul Ramírez Jonas, Amy Sillman, and Mickalene Thomas, each of whom proposed several promising artists. Brooklyn Museum curator Eugenie Tsai made the final selections. The seventh exhibition in the Raw/Cooked series, titled Supple Beat, presents the work of Gowanus-based artist Marela Zacarias. Recommended by Ramírez Jonas, Zacarias has created four site-specific sculptural works inspired by the Williamsburg Murals, uniting her interests in abstract forms, the history of objects, and urban renewal. Her large-scale pieces appear to be climbing the walls of the Museum’s first-floor lobby and Great Hall, interacting with the architecture as if they were murals come to life. Zacarias draws on the concept of resilience implied by the Williamsburg Murals and explores the idea of bouncing back from adversity, relating to the history of the public housing project for which the murals were commissioned and the history of the works themselves. She constructs her unique sculptural forms from window screens and joint compound, which she then paints with original patterns. 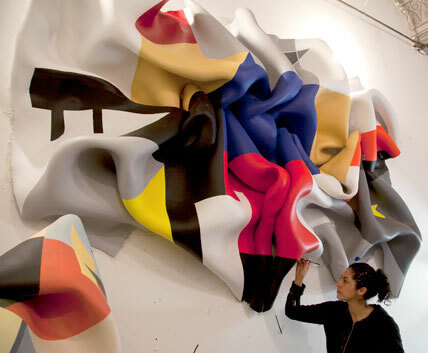 In Supple Beat, Zacarias’s patterns are inspired by the related murals’ unique color palettes and geometric forms. Born and raised in Mexico City, Zacarias has painted more than thirty large-scale public murals. She holds an MFA from Hunter College. 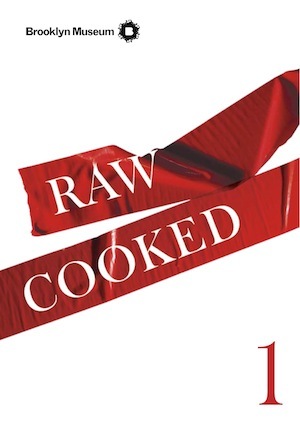 Raw/Cooked is organized by Eugenie Tsai, John and Barbara Vogelstein Curator of Contemporary Art, Brooklyn Museum. Marela Zacarias discusses her Raw/Cooked exhibition.